It starts with the Doctor arriving in 1828 London or more specifically the Thames Tunnel. The workers there, including Isambard and Beamish, have a problem – ghosts. When the Doctor arrives on the scene he is mistaken for a trespasser and led off to speak to Marc Brunel who enlists the services of the Doctor to investigate the hauntings. The Doctor soon discovers that the tunnelling has encroached on a portal to another world. At the halfway point to the story the Doctor and Isambard cross to the other world and the story mostly continues from this side. I very much enjoyed the characters and the actors do play them well. Colin Baker plays the sixth Doctor with a sense of exuberance and excitement at meeting the Brunels. 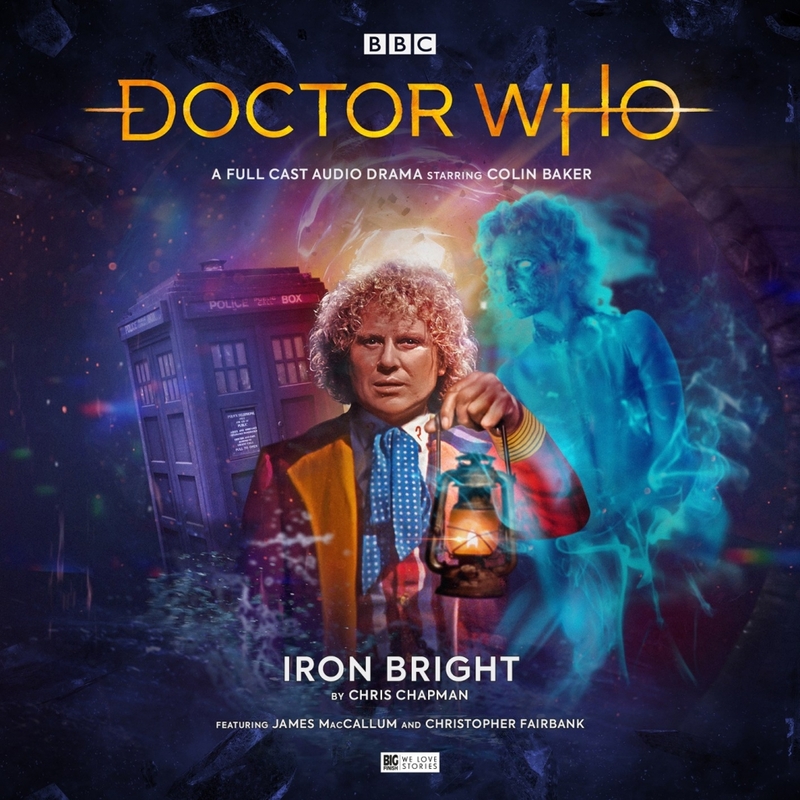 I very much enjoy Colin Baker in audio form and feel that he has had a series of excellent stories that showcase his Doctor brilliantly with some excellent companions like Evelyn Smythe (Maggie Stables). However this adventure and many of Colin Baker’s have him without a companion and I have to agree that he works quite well without a companion, much better than the seventh who I feel needs a companion to counter his darkness. Isambard Kingdom Brunel is played by James MacCullum and his performance is a joy. There is a particular scene where the Doctor shows Isambard the interior if the TARDIS and you can just hear his brain ticking over as he tries to figure it out. For the most part his character is well written and helps to fill a gap in real history when Isambard stopped working on the Thames Tunnel after a serious accident and was rescued by Beamish. I particularly enjoyed the characterisation of the younger Brunel once he and the Doctor had travelled through to the other world. He is actually entranced by what is going on and the story seems to imply that these will be the inspirations for his many works. Of note is a scene later in the story where Isambard struggles with his own morals. For me I wish this had been pushed to the front a little more and had more time devoted to it, as for me this was a standout scene. I also wish that this scene involving the TARDIS had been the impetus for how the Doctor is rescued as I think the idea of Isambard trying his best to help would have been fantastic. Two others of note in the cast are Catherine Bailey and Becky Wright who play Tan and Flo respectively. Tan is a visitor from the otherworld who has an interest in seeing London kept safe. I very much enjoyed the performance of Tan, her lively enthusiasm and nerdiness around spotting the different types of Londoner was very amusing. I felt her character wasn’t as well utilised in the last part of the story and served more to react to events. More successful was the character of Flo, who works for the Brunels keeping their house in order. She comes into her own as she discovers how much more to life there is and I really enjoyed her reactions throughout the story. The story serves up a lot of themes and although I have not heard Chris Chapman’s other stories (as far as I remember), I am assured that his other stories have a similar quality. The story touches on the effects of pollution and has a turning point where taking responsibility for your actions comes more to the fore. I for one very much enjoyed the themes and I really enjoyed how Chapman utilised one theme to drive the other. I think that the dialogue and writing was spot on and I loved the way the Doctor’s intelligence was used to help solve the problem rather than the wave of a sonic. I am very much looking forward to hearing more of Chapman’s work. I cannot review without talking about the points that were not as good and it is my typical Big Finish problem. Some of the action was a little vague. I get leaving it up the listeners’ imagination a little but there comes a point where the action gets too out there and I needed a little more guidance. I had a similar problem in UNIT: Cyber reality and Dark Eyes, both of which I have listened to recently. It is quite apparent that everyone at Big Finish to know exactly what is going on but sometimes that does not translate as well for the listener who is coming to it fresh without discussion, or script, or anything else. I would have felt this would become less of a problem as time goes on but for me as the scripts get more ambitious, as the action gets bigger it is a recurring problem. Please do not think this is a major fault in this audio, it is minor at best but still a niggle I felt worth pointing out. Another point to note is that this is the first Big Finish story to feature the new Doctor Who logo BBC introduced for Jodie Whittaker’s Doctor. I personally do not see the point for the classic adventures and my main issue is that the font the supporting cast and story credit are written in is now a little on the small side, even for someone with very good eye sight. I do however appreciate the picture being seen in full on the CD cover.